Why settle for less than the fullest, greenest, most aromatic foliage decorations? At Sturgill’s Tree Farm, we pride ourselves on our ability and knowledge to grow the finest Fraser Fir, White Pine and Blue Spruce. Not only do we have farms in 5 different counties in Western North Carolina, Virginia and West Virginia, but we have also been in business for over 30 years! We have the resources, we have the experience, and we have the commitment and care for our customers’ satisfaction. Sturgill’s Tree Farm ships nationally. If you have the pleasure of living in any of our gorgeous surrounding areas, you are able to set up a time when you can come in and pick up your holiday decorations. Some of our more popular products are our Fraser Fir wreaths. Our live Christmas wreaths come in a few different styles. Call ahead so that we can make sure to meet your evergreen needs. Here at Sturgill’s Tree Farm, we are happy to work on custom orders for any and all Fraser Fir wreaths that you need. 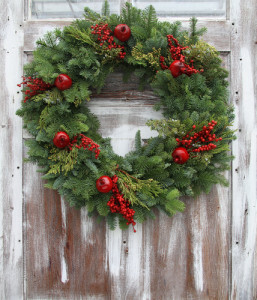 Maybe you don’t have an eye for decorating; call ahead and ask us about our options for decorated Christmas wreaths! We also feature different shapes of live Christmas wreaths. Shapes can include: candy cane, heart shaped, Christmas tree shaped, etc. When it comes to foliage, fresh is never a bad thing. Why not have fresh holiday decorations from one of the finest Christmas tree farms in the nation? North Carolina itself produces over 19% of the nations’ Fraser Fir Christmas trees. Not only is this a large portion of the nation’s Christmas trees, but North Carolina Christmas trees are the most popular tree in North America, being shipped all over the United States, Mexico, Canada, Bermuda and even Japan. There’s something magical about a tree that stays green even through the coldest temperatures. Check out our Products page to see some of our gorgeous Christmas wreaths for sale. Our live Christmas wreaths are mostly Fraser Fir but we do offer them mixed with White Pine. Perfect to spruce up an office or home, we will work with you to give you the wreath that you have been pining for. Don’t go barking up the wrong tree this season. Make Sturgill’s Tree Farm your one and only stop for all of your seasonal foliage decorations.